Belfast International Airport will expand its security area from six to eight search lanes. The move comes after the airport apologised following long security queues in recent months. Passengers posted pictures on social media in January which showed queues stretching down staircases. The airport said it would have to reduce the current six security lanes to five until mid-March to carry out the expansion work. A spokesperson for the airport said: "We understand this may cause some delays and are advising customers to arrive 2 hours prior departure". 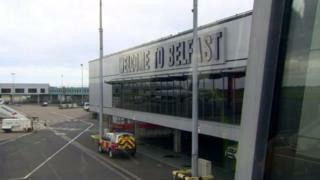 Belfast International Airport has previously said a "high number" of passengers caused recurring long security queues. In May 2018 it apologised to passengers for delays at security, describing the situation as "an unacceptable standard of service". Some passengers reported missing flights due to the delays. In summer 2018 the airport responded to passenger complaints by saying it would hire additional staff to help reduce delays. Security Firm Wilson James, which took over the airport's security services in November, said it was recruiting 50 new security staff to help alleviate the problems. The company said it "inherited a staffing shortage from the previous provider, which has continued to impact the service delivery".